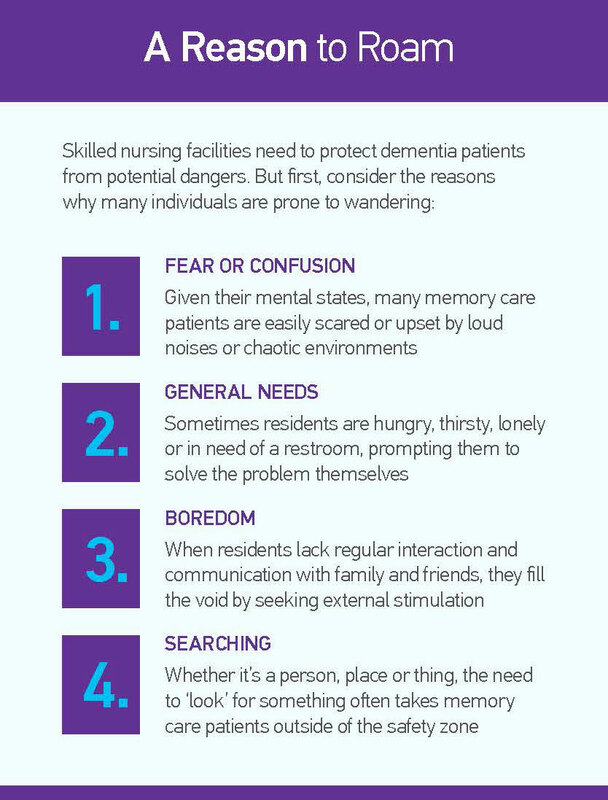 In long-term care, we face a number of challenges when it comes to caring for dementia and Alzheimer’s patients. We strive to respect their freedoms; but above all else, resident safety remains a foremost concern. On the one hand, taking a daily stroll around the halls empowers residents with a sense of autonomy. It’s a great way to promote healthy exercise and provide much-needed mental stimulation, especially for folks without regular visitors. But on the other hand, memory care patients are prone to life-threatening falls. If they wander outside, they may become lost and vulnerable to the elements. Not to mention, unsupervised patients could pose a danger to other residents. Traditional approaches include the installation of door locks, alarms and pressure-sensitive mats. Also, many facilities make sure that important locations—such as bathrooms and dining areas—are clearly marked, while exits are subtly camouflaged to deter residents from roaming outside. These measures are a wonderful start. But consider the following story from a facility in Fort Worth, Texas. Hoping to maintain a person-centered program, Legend Oaks Healthcare and Rehabilitation Center built a bus stop in one of their busy hallways as a familiar reminder to patients. Replete with a bench, town map, STOP sign and lamppost, the station serves as a reassuring place where wandering residents may rest, relax and orient themselves in moments of stress. The project cost a few hundred dollars and has inspired better behaviors across the unit. Another nursing home in Massachusetts piloted a similar initiative called ‘The Bus Stop to Nowhere,’ which is located outside in a grounds courtyard. Check out the video to experience a first-person view of the project. Interestingly enough, researchers say the trend started in Germany but is gaining steam across America. Have you thought of other inexpensive ways to engage dementia patients? Is your staff exploring new measures for enhanced safety? Be sure to share your own inspiring stories.